Edvard Grieg (born 15 June 1843 Bergen, Norway; died 4 September 1907) was a Norwegian composer and pianist who composed in the Romantic period. He is Norway’s most famous composer. He is best known for his Piano Concerto in A minor and for his incidental music to Henrik Ibsen's play Peer Gynt, which includes movements called Aubade and In the Hall of the Mountain King. He wrote many pieces for piano, including a collection of 66 pieces called Lyric Pieces. He also wrote songs to Norwegian and to German words. Grieg was born in Bergen on 15 June 1843. His ancestors were Scottish people who had moved to Norway around 1770. The original family name was spelt "Greig". Grieg came from a musical home. His mother was his first piano teacher. He went to several schools, and started composing when he was young. He used to take his compositions to school, but the teacher did not show much interest in them. In the summer of 1858 Grieg met the great Norwegian violinist Ole Bull, who was a friend of the family, and whose brother was married to Grieg's aunt. Bull noticed the 15-year-old boy's talent and persuaded his parents to let him go to Leipzig in Germany to study music. Grieg enrolled in the conservatory, concentrating on the piano, and enjoyed all the concerts and recitals given in Leipzig. He did not like the discipline of the conservatory course of study, but he still got very good grades. The first piano recital he gave was in Sweden. In 1862 he finished his studies in Leipzig and went back to Bergen where he gave another recital. In 1863 Grieg went to Copenhagen, Denmark, and stayed there for three years. He met the Danish composers J. P. E. Hartman, and Niels Gade. Gade told him to go and write a symphony. Grieg did not feel happy writing a long symphony although he did try. He also met the Norwegian composer Rikard Nordraak who had composed the Norwegian national anthem. Nordraak showed Grieg how wonderful Norwegian folk music was. Grieg had hardly heard any Norwegian folk music until then. When Nordraak died, Grieg composed a funeral march in his honour. On 11 June 1867, Grieg married his first cousin Nina. The next year their only child, Alexandra, was born. The following summer, Grieg wrote his Piano Concerto in A minor while on holiday in Denmark. Edmund Neupert gave the concerto its first performance on 3 April 1869 in the Casino Theater in Copenhagen. Grieg himself was unable to be there because he was conducting in Christiana (now called “Oslo”). In the summer of 1869, Grieg's daughter Alexandra became ill and died, at the age of 13 months. In 1870, he met Franz Liszt in Rome. Liszt had made it possible for Grieg to get a travel grant. They played Grieg's Violin Sonata No. 1 together, which Liszt liked very much. On a second visit, in April, Grieg brought with him the manuscript of his Piano Concerto which Liszt played by sight. Liszt gave him some advice about the orchestration. Grieg spent most of his time conducting and playing the piano in concerts. He often travelled, and in 1876 he went to Bayreuth to hear the first performance of Wagner’s Ring cycle. He wrote a review of the operas for a Norwegian newspaper. In 1876, Ibsen asked Grieg to write some incidental music for the first performance of the play he had written about the Norwegian hero Peer Gynt. Many of the pieces from this work became very popular. They are played by orchestras as well as in arrangements for piano or for piano duet. In 1883 he and wife parted for a while, although friends managed to persuade the couple to come together again and they spent four months in Rome. They built a house called Troldhaugen in Bergen, with a view of the fjord. 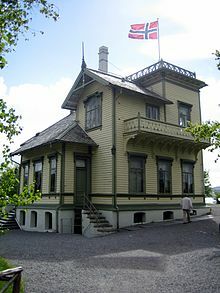 They moved into the house in 1885 and Grieg lived there for the rest of his life. They continued to travel and give concerts. Nina had a good voice and sang her husband’s songs. Grieg only performed his own works at concerts. During his last years he received many honours. In his later life Grieg became famous, although never rich. The Norwegian government gave him a pension. Grieg made some recordings of his piano pieces. These are some of the very first gramophone recordings that were made. The sound is not very good, but they show that Grieg was an excellent pianist. He also recorded music rolls on a pianola. Edvard Grieg died in the autumn of 1907, aged 64, after a long illness. He had suffered from respiratory problems ever since he was very ill in 1860 as a student in Leipzig. At his funeral thousands of people went out on the streets of his home town to honour him. Following his wish, his own funeral march for Rikard Nordraak was played, as well as the funeral march by Frederic Chopin. His and his wife's ashes are buried in a mountain crypt near his house, Troldhaugen. Grieg was often inspired by Norwegian folk music. This can be heard in his songs and some of his instrumental music. His chamber music includes 3 violin sonatas and a cello sonata as well as a piano sonata and many shorter piano pieces. However, he has become very well known all over the world through his Piano Concerto and his music for Peer Gynt. Another popular work is his Holberg Suite which was originally written for the piano but later arranged for string orchestra. The famous opening of Grieg’s Piano Concerto featured in a comedy sketch by Morecambe and Wise in the 1970s. The conductor André Previn was their special guest in the sketch which has become a classic. This page was last changed on 19 September 2016, at 00:02.